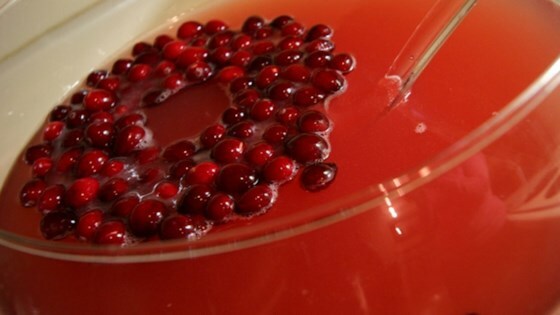 "Great non-alcoholic punch! Make a day in advance to allow the flavors to meld." To serve, pour juice mixture into a punch bowl. Stir in ginger ale. I thought the almond flavor was a little strong. Also, I was hoping for a redder punch, as the picture shows. Mine was not a very attractive color. This is a super-delicious punch! I always serve it for Christmas and I am always asked for the recipe! Don't pass this one by! Easy and delicious. Make 1 day ahead. I used only 2 tsp. Almond Extract, and it was delicious. Everyone at the jewelry party loved it! I will definitely make it again. Great recipe! I left out the sugar and almond extract ( didn't have any) and it turned out wonderfully! Everyone raved about it! A tasty punch recipe that isn't loaded with a ton of sugar. The almond extract adds a nice flavor. I made this punch for an office party last week and it got such rave reviews everyone at work is requesting it everyday! I also floated fresh cranberries and pineapple in for decoration.